High blood pressure is a silent disease. It can be asymptomatic for many years until it manifests as a sudden heart attack, stroke, kidney failure or peripheral vascular disease. Diagnosis of high blood pressure (hypertension) is performed at the doctor’s clinic by inflating a cuff around the upper arm. Several measurements are required to confirm the presence of hypertension. Sometimes, the anxiety of a doctor’s visit may falsely elevate one’s blood pressure, with blood pressure returning to normal at home; a condition known as “white coat hypertension”. This may lead to unnecessary use of medications and subsequently adverse effects. This can be overcome by having an ambulatory 24 hour home blood pressure monitor. This is an automated blood pressure monitor that is strapped to the upper arm for 24 hours. It inflates to measure your blood pressure at specified times (eg: every ½ to 1 hour) and records it on a portable computer. Therefore measurements are performed in your own environment and will be more reflective of your true day to day blood pressure. 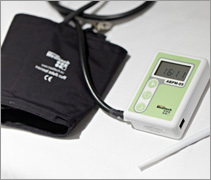 The benefits of a 24 hour blood home pressure monitor is in identifying white coat hypertension, guiding the titration of medications to achieve target blood pressure and to correlate symptoms such as lightheadedness with blood pressure.